A 71-39 thrashing at Utah Sunday sent UCLA to 0-2 in Pac-12 play and 8-7 overall, virtually ensuring the Bruins will not qualify for the 2015 NCAA Tournament barring a run through the conference tournament. In that score — 71-39 — all the frustrations of a program playing in a half-empty arena, competing as much with history as it is the opposing five on any given night, are succinctly captured. 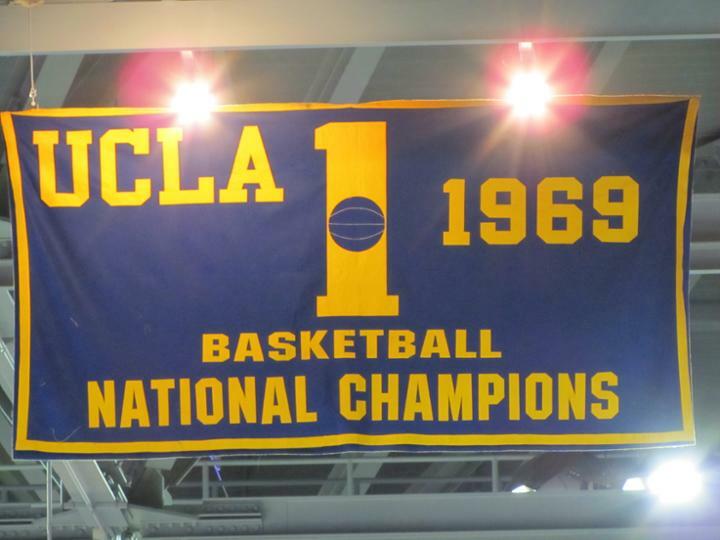 One could argue that UCLA is the quintessential “Basketball School.” In the 60 years since the Bruins’ last national football championship, UCLA basketball claimed 11 national championships. Eleven. UCLA football still lacks hasn’t won a national championship, nor has it produced a Heisman Trophy winner. But by being consistently competitive for three years and putting more than 80,000 fans into the Rose Bowl every home game this season, the gridiron Bruins have surpassed the hardwood version. It’s a rather shocking state of affairs, but barring some drastic shake-up, it’s going to be the norm. And right now, the most dramatic change rumored in Westwood is head football coach Jim Mora entertaining the NFL. Rather than basketball rising up to meet the new standard football is setting, a regression of the football program to the mediocrity in which UCLA basketball is currently mired seems more realistic. And it is indeed fair to label UCLA basketball as mediocre right now, despite its Sweet 16 appearance and Pac-12 Tournament championship a year ago. UCLA has a self-imposed standard that is loftier than most college basketball programs. Arguably, that standard is as much to blame for UCLA’s inability to regain national prominence as anything else. This year marks the 20th anniversary since UCLA’s last national title on the hardwood, a shockingly long drought for a program dubbed basketball royalty. Five programs make up college basketball’s aristocracy: Duke, Indiana, Kentucky, North Carolina and UCLA. Of these blue bloods, UCLA has the most national championships. However, three of the Bruins’ counterparts have won multiple championships since UCLA last won one. Duke went nine between Mike Krzyzewski’s third title and his fourth. North Carolina waited 11 years between Michael Jordan’s jumper and Donald Williams’ frog-legged dunk, then another 12 until Sean May and Co. claimed the title. Kentucky was the John Travolta of college basketball’s elite, claiming the limelight in 1978 but fading until the mid-1990s. And last year, UCLA surpassed that particular drought, UK’s longest of the last four decades. The Wildcats have pretty much been fine since. Bruins would be hard-pressed to disagree. Only Indiana has a longer dry spell, which is ongoing since 1987. However, the nature of Indiana’s struggles differs greatly from that of UCLA. Indiana was first hamstrung by the acrimonious departure of the architect of its success, Bob Knight. Then, as Kelvin Sampson was getting Indiana going, the Hoosiers were crippled by NCAA sanctions. UCLA’s stagnation is more akin to a Los Angeles traffic jam: Frequent starts, ending with a quick slamming of the brakes. The latest example is the seemingly ill-fated tenure of current head coach, Steve Alford. Alford is all of 1.5 seasons into a seven-year contract, and he already feels like a lame duck. Of course, this could have been said of a coach whose only Sweet 16 appearance prior to arriving at UCLA came 15 years ago at (then-Southwest) Missouri State. Buying Alford out of his contract might require athletic director Dan Guerrero going door-to-door in Bel Air to take up collections, because UCLA needs a whopping $10 million to make it happen. Not if, but when UCLA opts to part ways with Alford, his successor will be the Bruins’ nine coaches since John Wooden called it a career in 1975. And, just like Alford, Ben Howland, Steve Lavin, Jim Harrick, Walt Hazzard, Larry Farmer, Larry Brown, Gary Cunningham and Gene Bartow all fell well short of the program’s standard. Harrick is the only UCLA head coach to win a title since Wooden, and Harrick was ousted under a cloud of NCAA sanctions shortly after doing so. In that sense, modern-era UCLA is more comparable to UNLV than it is Kentucky, North Carolina or Duke. Howland is the most successful in the long line to sit in Wooden’s throne, having made three straight Final Fours from 2006 through 2008. But Howland’s inability to add to the 11 championship banners hanging in Pauley Pavilion, coupled with his sub-par recruiting in talent-rich Southern California, led to his ouster. With every failed tenure, UCLA moves further from its glory days. And, as the Bruins are more removed from their glory days, the more apathy sets in with the fan base. Pauley Pavilion is like a ruin of a fallen empire now its many empty seats for any given Bruins’ home game. Perhaps there’s a Basketball Nick Saban out there, just biding his time for the right moment to descend upon Westwood, refill the empty seats at Pauley Pavilion and restore UCLA basketball to greatness. Or maybe this particular line of Basketball Royalty has as much modern-day relevance as the Kingdom of Syracuse (which has nothing to do with Jim Boeheim). Previous article Is Bob Stoops on a Mack Brown Career Arc?